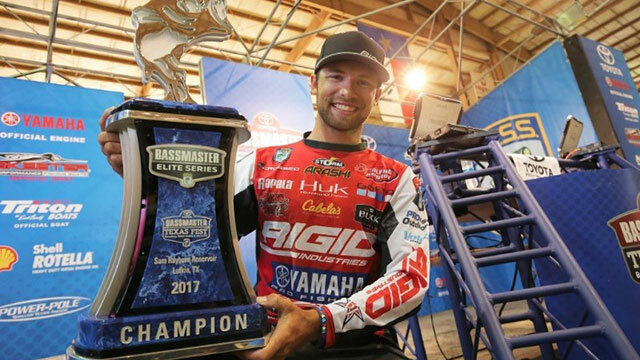 It’s not like Brandon Palaniuk had never won a Bassmaster Elite Series event. Coming into this week, the 29-year-old pro from Idaho had already claimed Elite Series trophies in 2012 and 2013 and came close to raising that win total with three other second-place finishes. But for an intense competitor known as the “prodigy,” the four-year victory drought was an itch he desperately needed to scratch — and he did it during the 2017 Bassmaster Texas Fest benefiting Texas Parks and Wildlife Department. Palaniuk caught 24 pounds, 7 ounces of bass during Wednesday’s opening round and followed with 23-2 and 24-7 the next two rounds. Then he caught he caught 21-12 on Championship Sunday to push his four-day total to 93-12 and hold off a late charge by California pro Brent Ehrler. Ehrler, who led the first two days, finished second with 91-12. “I never found a school in practice where I could just go and pound on them and catch multiple fish in one spot,” said Palaniuk, who earned a $100,000 first-place prize and an automatic berth into the 2018 Bassmaster Classic. “It wasn’t until the tournament started to roll around that more and more fish started to transition out and school up on spots. It was a sign of things to come for Palaniuk when he started Wednesday’s opening round with his biggest fish of the tournament — a largemouth that weighed 8-4. Palaniuk caught the bass in deeper water than what was being fished by most of the field. That gave him the confidence to stay away from the shallower areas that were holding incredible numbers of bass, but not necessarily the size it would take to win. Palaniuk said he spent a lot of time idling around looking for the usual summer postspawn hot spots, like the tips of points, humps and ledges. He found lots of smaller fish on those places. But while moving from spot to spot on straight banks, he found a several brushpiles on his Humminbird electronics with incredible numbers of crappie and one or two bigger dots that he believed were bass. In that situation, he used a Neko Rig with a Zoom Magnum Trick Worm — and immediately caught a big fish. Palaniuk was throwing the Neko Rig on 15-pound Seaguar braid with a 10-pound fluorocarbon leader. Since many of the fish were in brushpiles, he wasn’t able to put them all in the boat. By the final day, he seemed to have all of the kinks worked out of his technique. Palaniuk’s key bait for shallower, more aggressive fish was the size 13 Storm Arashi Top Walker in the pro blue color pattern. For deeper fish — since he couldn’t get bass to bite a crankbait — his top two lures were a 10-inch Zoom Ol’ monster worm in the plum color pattern with 1/2-ounce VMC tungsten weight pegged with a VMC stop on a 5/0 heavy-duty VMC extra-wide gap hook, and a Neko Rig Zoom with a green pumpkin magnum trick worm on a 1/0 weedless Neko hook that will debut at the annual ICAST fishing industry trade show in July. Though Ehrler finished 2 pounds away from his first Elite Series victory, he didn’t go home emptyhanded. For catching the Toyota Big Bass of the week — a 9-1 largemouth on the first day — he earned a $50,000 Toyota Tundra pickup truck. Oklahoma pro Jason Christie finished seventh in the event and came away with a solid lead in the Bassmaster Angler of the Year standings. Those standings will largely determine the participants for the 2018 Classic — something Palaniuk is glad to have already sewn up. He said that means he’ll be more relaxed as the scheduled swings back toward the northern lakes where he learned many of his tricks. Jason Christie was awarded $1,000 for the leading the Toyota Bassmaster Angler of the Year points race at the end of the event. Brandon Palaniuk won the Toyota Bonus Bucks Award of $3,000 for being the highest-placing eligible entrant in the program. The second-highest-placing eligible entrant, Jordan Lee, received $2,000. Christie also earned the Power-Pole Captain’s Cash Award of $1,000 for being the highest-placing angler who is registered and eligible and uses a client-approved product on his boat. Ehrler also earned $500 as the recipient of the Livingston Lures Day 2 Leader Award. Click here for complete event results.